WAN optimization is a widely used technology that improves the efficiency of network data transmission. SafeNet Ethernet encryptors are Layer 2 (data link) appliances that secure traffic at wire speeds across wide area Ethernet services to provide protected information transmission. 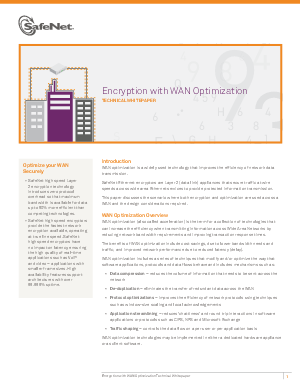 This paper discusses the scenario where both encryption and optimization are used across a WAN and the design considerations required.